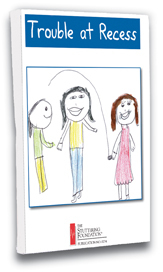 This 30-page book written and illustrated by 8 year-old Jamie describes the tribulations that many children who stutter encounter both in the classroom and on the playground. Jamie was encouraged to write the book by her speech-language pathologist, Julie Gasway, M.A., CCC-SLP. "The initial goal of writing the story was to help Jamie develop a positive feeling about stuttering and an awareness that all kids have problems they have to deal with," said Gasway. "The plot of Trouble at Recess was formed when Jamie started therapy with me. We read books about stuttering, watched other kids who stutter on the DVD Stuttering: For Kids, By Kids, and learned more about how others deal with teasing," added Gasway. Molly, the main character who stutters, learns what to do when she is teased. She also learns what makes a good friend and how to teach classmates about stuttering. Jamie shares, I'm very excited that my book might help other children who stutter." Because it deals with problems that all children encounter, this book should have universal appeal.